Indiana is home to America’s third-largest Amish population. Indiana has the most settlements founded in the 1800s (6), and the most communities over 10 church districts in size (5). Indiana has the largest Swiss Amish population. You’ll find Lancaster gray-topped buggies in two settlements in the state. Lancaster Amish first came in the 1990s. Amish in northern Indiana are heavily employed in the local RV industry, though there is a significant business presence in the region, as well as statewide. Indiana Amish businesses include woodworking shops, construction firms, and dry goods and other specialty shops (read more on Indiana Amish furniture). Find more on Indiana Amish in today’s new State Guide entry. I much enjoyed putting this entry together, and one reason is the photos I found illustrating the diverse communities in this state. Old order Mennonite Jeans brand new post in today on Amish Stories folks, and look for her very first homemade recipe to be posted on the blog this wednesday (whoopie pie)………..Indiana looks like a nice state to visit. The Amish in the photo i see is riding a real bike and not a Amish Scooter, the rules sure are different depending on church district rules. Richard from the Amish settlement of Lebanon,Pa. This is a photo from the Lagrange/Elkhart County settlement, where bikes are used heavily. The Allen County people, for instance, use scooters instead. No fancy bicycles for them. Its a very big challenge in trying to keep up with all the different and changing rules in the Amish community Erik, maybe that’s one reason it also makes it fun. Thank you for the info. And im glad i was able to get on Amish America today. Richard from the Amish settlement of beautiful Lebanon Pennsylvania. I’m switching locations here but this post made me think that there is no better group to ask than the Amish America folks about making a visit to Lancaster. I have a trip planned at the end of September so any ideas, information or recommendations would be appreciated! 1. 2 towns-Strasburg and Churchtown-the most picturesque, imo, in the County. 2. Leola produce auction. Or any other that might be going on while you’re there. 3. Southern end of the county–less busy, more ‘country’. Thanks, Erik. The farm we’re staying at in in Strasburg so I’m glad to hear that was a place you liked. Also like the idea of ‘less busy…more country. The Amish in Parke County, Indiana, use the scooters. I’ll be sure and do that, Richard. Thanks for offering! 1. Fisher’s store at the crossroads in Georgetown (Rt 896 south of Strasburg about 5 miles). Nice little variety store. 2. Near Fisher’s about 1 block away (right across from the Bart firehall where their mud sale is held) is a nice Amish operated family style restaurant. Opens at 6 AM I believe, nice and homey, good food and prices. 3. Another good variety but mostly book store is the Gordonville Book Store on Old Leacock Rd between Rt 30 & Rt 340. 4. The 3rd Saturday in September is the benefit auction for the Clinic for Special Children, held at the Leola Produce Auction on Brethren Church Rd in Leola off Rt 23. 5. I recommend a buggy ride from Abe’s in Bird-in-Hand. One of the few places that has “real” sized buggies (ask for the small ones), in addition to the larger touristy type. 6. Be on the lookout for Amish yard sales. Where can I find out more about the Amish living in the southern part of Ohio, if there are any there? We are planning a vacation to the area the first part of July to see the Barn Quilts in the area. And now for some devastating news………. PHILADELPHIA – Drivers for a Philadelphia bakery that supplies rolls for some of the city’s most famous cheese steak joints are on strike. That means no rolls for those delicious Philly cheese steak sandwiches. Ill be at the local dairy queen trying to solve this most catastrophic problem, and drowning my sorrows with a few chocolate milk shakes. Richard from the Amish settlement of Lebanon Pennsylvania. Ha!. You are too funny Richard! What a wonderful problem to have…Philly cheese steak or ice cream! Thanks for the info Rick. You suggested a number of things that I would be interested in! Hey There – Hope everyone is enjoying the first day of SUMMER! There is another Amish doc. on Nat Geo titled “Amish on Break” where 5 Amish teenagers visit the UK – Just thought I’ll pass it along for those who would like to watch or didn’t know. So are the majority of the Amish in Ohio in the central part or somewhere else? I love to shop in Amish places of business. Richard, you’ve now caused me to post a totally of topic comment. Now, I dont think Im too old – Im near 30 (and, were I Amish, a hopeless old maid I’m quite sure *smiles*) – but does anyone else recall when Dairy Queen called their lovely ice-and-syrup drinks “Mister Misties”, instead of this new, ugly name, “Arctic Freeze”? Speaking of which, Id love a cherry one about now. And, whenever I order, I still call it by its original name; somehow, they always know what I’m talking about! So sorry to take the thread away from Amish in Indiana, but any mention of Dairy Queen and my mind wanders…..
Richard, you’re making me hungry for a peanut buster parfait! The photograph makes me think of my Tuesday afternoon. I went to apply for a job, and I see this elderly man on the sidewalk a little bit ahead of me. I think “wow, he’s making good time, he is using that cane, no, wait, he’s got it stuck under his arm now” and I see him run across the busy road at the crosswalk, I got a good look at him from the back and thought “wow he looks Amish, is that an omen for me?”, he wore dark slacks, a solid blue collard shirt, black suspenders and an appropriately shaped straw hat. 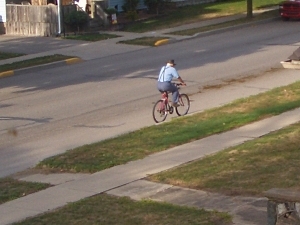 I lost track of him, I suspect he was going to the mall up the road. My email has nothing to do with he Amish in Indiana, but rather, with the Amish in Idaho! I was told this evening that an Amish family was seen on the Costco parking lot in Nampa, Idaho. Nampa is about 25 miles south west of Boise. Since I will be moving to that area, Is there anyway you can find out that there are actualy Amish in that area? You might want to visit the small Amish community of Calais located in the northwest corner of Monroe County, OH. There are barn quilts in this area as well – at least there were when we last visited about 8 years ago. And there was an Amish variety store as well. Be sure to report back on your adventures! Hi George, as of last year there are no Amish in Idaho, unless a totally new community has started up in the meantime, but I haven’t heard anything. It’s possible this was a family en route to somewhere else, on vacation, or even another Plain group similar to Amish? The Young Center should be coming out with some new Amish national statistics and if they have detected Amish in Idaho we’ll probably hear about it from them. But I haven’t heard anything about Idaho from them or any other source (though there used to be at least one community there, in the early 2000s, at Bonner’s Ferry). Karen, most of the Ohio Amish are in the north, center, and northeast of the state, but there are some scattered groups in the south. One of the bigger ones is in Gallia county near Gallipolis. You’ve also got some smaller communities of just a congregation scattered in different counties, but may not be more than a few families. Your best bet is probably to get up to Holmes County and environs if you’d like to visit Amish shops, etc. Is your friend certain they were Amish and not conservative Mennonite? There are conservative Mennonites in Cataldo, Idaho. I have no idea if that’s near Boise or not. Sorry Erik, we’ve certainly taken the Indiana thread off track ;-). Thanks Matthew! I’ll do a little research and see what I can come up with. Erik, This is just a short 4 day trip from western KY to Ohio. Someday we’ll go back and travel further. I ahve to be honest, I was disappointed with Lancaster. The area was so commercialized. There just wasn’t the charm that I found in the Shipshewana/Nappanee area. We only stayed a couple of days. I agree with you Karen, that Lancaster is to commercialized. I hated it when I was back there. The Amish communities in Minn. and Iowa are much better and more real. I hear the same for the communities in Colorado. Cataldo is quite a way north of Nampa. Thank you for listing the 5 Mennonite churches in Idaho, I will look up the Cities to find out how close they are to Nampa. Yes, it could be a new Plain group similar to Amish or Amish on vacation. However, a barn was seen in that area with Amish markings. I will talk to my relatives this evening and find out about the barn, I will ask them to send photos. I will let you know if additional information comes to light. Could it be part of a Barn Quilt trail? It may not be Amish owned at all. Karen in Kentucky who is looking forward to seeing the Quilt Trail in Ohio over the July 4th weekend! I don’t currently reside in Idaho but will be moving there within 6 months or so. Therefore, I cannot investigate the barn painting. I looked on the Idaho map and of the 5 Idaho towns you listed with Mennonite churches, New Plymouth is only about 35 miles north east of Nampa. The next closest City to Nampa is Grand View, probably about 48 miles from it. Nampa has some very nice shopping centers I hear. So it’s possible, that the family seen shopping, is from New Plymouth. Personally, I hope they reside somewhere in the Nampa area. There has been only one Amish settlement in Idaho at Bonners Ferry. It existed from 2000 until 2004. According to the data I have from 2010, no settlement currently exists. However, there are plenty of different Mennonites there, and lots of people confuse Old Order Mennonites with the Amish. Hi! I’ve been to the Lancaster area twice and now will have the opportunity to visit Indiana in a few weeks. We would love to visit some of the Amish settlements while we are there. If you had 3 days, what would be your itinerary? While there, where would you stay that is off the beaten path? Many thanks for your help! I like to buy some food Thanks! Well, the 4th of July trip to Ohio didn’t happen. Car problems delayed our trip. But, that’s going to be okay, because we’re now going in September around the middle of the month. There’s going to be a great quilt shop hop through that area beginning with Cabin Arts Quilt shop in KY, moving on to IN for one shop and then the remaining seven are in Ohio. Then on to Barn Quilt search and possibly the Amish area as well. We’ll have a week this time. So, looking forward to getting away for a little while. I was in the Shipshewana area in May for a wedding. Spent a lot of money at the Dutch Country Market buying pickles, a case of jam, and his homemade candy. I love that store. Also love the Cheese Factory north of town. Went to Lolly’s fabrics with my mom to help her pick out quilting material for a quilt I’m going to make forher. It was a productive trip for sure. Such an amazing area with so many things to see and do. Looking for stores closest to home. Where are the closest Mennonite and Amish stores to the Louisville, KY area? 812-755-5161. A nice store with furniture, housewares, bulk food, & deli. look for the signs by their driveways. in that area, although I think Yoder’s Variety closed in May 2013.
having new people visit her store which also has bakery and deli items. Hope this helps! We are so fortunate to have so many Amish and Mennonite settlements not too far from Louisville, and you will find interesting differences and similarities amongst the groups.